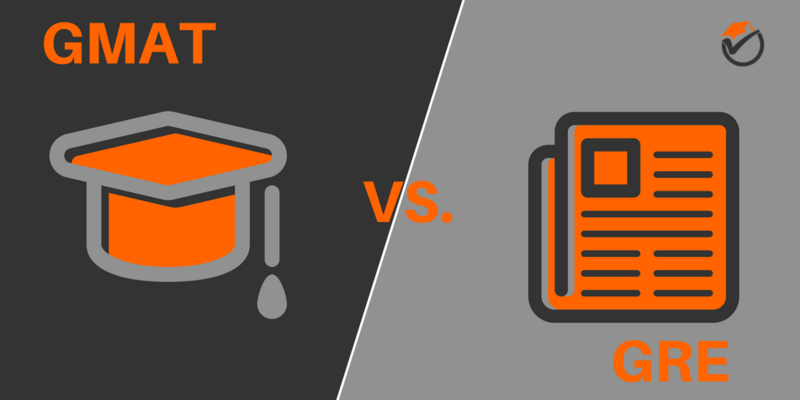 Home GMAT GMAT vs. GRE: Which Should You Take For Your MBA? There are many differences between the GMAT and the GRE. We will single those out in the paragraphs below. One difference between the two is that on the GRE you can skip questions and go back and forth between different problems. On the GMAT you can’t do this. If you do not know the solution to a problem on the GMAT you can’t skip it and come back; you need to answer it right then. Another difference between the test layouts is that the GMAT puts a greater emphasis on mathematical skill and on grammar during the English portions. While the GRE puts a greater emphasis on the verbal, vocabulary and writing portions of the test. Because of this, the GMAT is considered to be better to take for those that are good at math and the GRE is considered better for those that are better in language classes. Another dissimilarity between the two is that the GRE is sometimes offered as a paper-based test while the GMAT is only computer-based. Although the GRE can be taken as a paper test, these paper tests are only offered a few times in the year while for both the GMAT and GRE the computer-based tests are offered year-round. The 2 tests also differ between their costs, popularity and availability. The GMAT, compared to the GRE, is slightly more expensive. The GMAT comes in at $250 for taking the exam andl the GRE is $195. The GRE may be better for those that are on a really tight budget since it is $55 cheaper. Since the GRE can be used for many different graduate programs and not just for business schools, it has more test takers each year. The GRE has over 600,000 students take the test each year while the GMAT only has around 250,000. Since the GRE is more popular, it has more test centers around the United States. This can make it a lot easier to take the test if you live somewhere that is not very populous. Also, since it is taken more often, the GRE is offered more times per year than the GMAT. The 2 test also differ when it comes to how they approach the verbal and language sections. The GRE has 2 writing essays while the GMAT only has 1. This make sense since the GRE test is normally thought to put a larger focus on the language and writing portions of the test while the GMAT focuses more on math. The GRE also puts a greater emphasis on vocabulary and knowing the definitions of words. The GMAT does not include any questions of this type. Another difference comes between the two tests’ different math sections. Compared to the GRE, the GMAT is thought to have a more difficult math section. The math section on the GMAT has more questions of higher difficulty and really requires you to know more concepts in-depth to get the questions correct. This difficulty really comes out during the data sufficiency portion of the GMAT math section. Data sufficiency problems are not included on the GRE exam. Also, there is no calculator allowed on the GMAT, while you are allowed to use one on the GRE. This means that those students that are taking the GMAT really need to practice their arithmetic skills since they won’t be able to use a calculator as a crutch during the exam. What graduate programs are you looking at? One major factor that you have to consider is what type of graduate programs you are applying to. As we have covered in this post, most graduate programs take will the GRE while the GMAT is mostly considered just for business colleges. If you are planning on applying to more programs than just business, the GRE may be the better alternative. If you are planning on just applying to business schools to get your MBA, the GMAT should move up higher on your priority list. Only just recently have business courses been accepting the GRE exam as an entrance score for an MBA program. Some business school programs may still prefer GMAT scores over the GRE. You might want to ask the programs that you are applying to for which of the two tests they prefer. What graduate schools are you considering? As you very well may know, some business schools only accept the GMAT and not the GRE. It would be a very frustrating experience to take the GRE and then later find out that the program you are applying to only accepts the GMAT. It would be a waste of time, effort and money to take the wrong exam. Unless you know all the programs you are applying for also accept the GRE, I would err on the side of taking the GMAT. Are you better at Math or Verbal? Another main consideration to take an account on choosing between the GMAT and the GRE is whether your strengths lie in math or in language skills. As you very well may know, the GMAT is geared more towards math sections of the exam while the GRE is geared a lot more towards verbal, vocabulary and writing. The math section of the GMAT has more problems that are of higher difficulty than the GRE math questions. These math questions really test you on what you have learned during your college classes, while the GRE math problems are at a more high school level. Also, on the GMAT no calculators are allowed. While they are allowed on the GRE. The verbal sections on the GRE are geared a lot more towards verbal, vocabulary and writing. You will need to have a good grasp on the English language for these sections on the GRE, but on the GMAT, these sections are focused on a lot less.This means that the GMAT may be better for those that have learned English as a second language and do not have the necessary skills needed. Are you looking for a list of the best prep books for wither the GMAT or the GRE?